Scrupulously painted in encaustic wax and enlivened with gilding, every aspect of this Romano-Egyptian portrait identifies its owner as a person of substantial wealth and social position. The name Isidora (ICIDOPA) is written in Greek in red paint on the right upper shoulder of the mummy wrappings, and must refer to the deceased once encased in this “red shroud” mummy. The provenience of the original burial is unknown, however the curved top of the panel is commensurate with portraits found in Hawara, and a male “red-shroud” mummy has also been recovered there. The Getty Museum’s mummy of Herakleides (see 91.AP.6) also belongs to this rare type, less than twenty of which have survived. Isidora wears a traditionally hued lavender mantle. Black clavi (woven stripes) with gilded trim extend vertically from the panel onto the linen of the shroud, expanding the portrait over the linen wrappings. In its original condition we would expect Isidora’s red shroud with painted clavi to extend to her ankles and her forearms and hands to be depicted crossing her torso in a manner similar to other female red-shroud mummies. Like these women, Isidora was likely to have been depicted holding a rose-petal wreath in her upraised right hand: the tip of a gold-speckled rose wreath can be seen overlapping her proper left clavus. The surface of the portrait panel is essentially original. The encaustic wax was applied directly to the panel and ranges from lean to very heavy impasto. Brush marks and the use of a small tool for applying and manipulating the encaustic are visible on the surface of the panel. The neck folds were made by manipulating the wax in a zig-zag motion; the lips appear to be created from four different shades of red. Additional pigments include jarosite (yellow-brown), madder (pinks), copper mineral green, and lead white. Isidora’s tightly braided Trajanic hairstyle is wrapped into a plaited bun secured by a gilded pin to the top of her head. A silver hair ornament (painted in several shades of gray) can be seen to the left. Surmounting her brow is a large, impressive golden wreath with a central design perhaps having religious significance. Curls frame her face and corkscrew locks drop in front of her ears in accordance with a style popular during the latter years of the first century AD. Carbon 14 analysis of the linen at 43 BC – AD 122 accords with these stylistic traits. Isidora’s impressive earrings are distinguished by their unique size and luxurious materials. They consist of a horizontal gold bar suspended from a single pearl; itself suspending four gold vertical bars and each terminating in a pearl. She wears three necklaces connected at the front by an amethyst set into an elaborate gold mount. The topmost necklace appears to be of emeralds, pearls and gold beads, gems characteristically worn by elite women at this time; the central necklace is composed of connected gold plaques and the lowermost, largest and most elaborate has quite wide emeralds interspersed with square gold beads similar to those of the center necklace. Gold leaf has been cut into very small squares and attached to the encaustic surface in order to gild the painted jewels. Archeart Invest S.A. (Fribourg, Switzerland), sold to the J. Paul Getty Museum, 1981. Chamay, Jacques, Jiřì Frel, and Jean-Louis Maier. Le monde des Césars: Portraits romains (Geneva: Musée d'art et d'histoire de Genève 1982), p. 28; fig. 21. Rothe, Andrea. "Conservation Report on the Mummy Portrait of Isidora." The J. Paul Getty Museum Journal 10 (1982), pp. 195-96, with a postscript by Jiří Frel; figs. 1-2. Thompson, David L. Mummy Portraits in the J. Paul Getty Museum (Malibu: J. Paul Getty Museum, 1982), pp. 32-33, 64, no. 1, ill. (also on cover). Parlasca, K., J.-E. Berger, and R. Pintaudi. El-Fayyum (Milan: Ricci, 1985), p. 78, ill. p. 79. The J. Paul Getty Museum Handbook of the Collections. 1st ed. (Malibu: J. Paul Getty Museum, 1986), pp. 54-55. Fernandez, I. G. "J. Paul Getty Museum." Revista de Arqueologia 115 (1990), pp. 48-56; p. 55, ill. The J. Paul Getty Museum Handbook of the Collections. 3rd ed. (Malibu: J. Paul Getty Museum, 1991), p. 63. Carr, Dawson W., and Mark Leonard. Looking at Paintings: A Guide to Technical Terms (Malibu: J. Paul Getty Museum, with British Museum Press, 1992), p. 27, ill.
Caroselli, Susan L. Italian Panel Painting of the Early Renaissance in the Collection of the Los Angeles County Museum of Art (Los Angeles: Los Angeles County Museum of Art, 1994), p. 10; fig. 1. Doxiadis, Euphrosyne. The Mysterious Fayum Portraits: Faces from Ancient Egypt (London: Thames and Hudson, 1995), pp. 164, 218, no. 10; ill. p. 165. Corcoran, Lorelei. Portrait Mummies from Roman Egypt (I-IV Centuries A.D.); with a Catalogue of Portrait Mummies in Egyptian Museums (Chicago: Oriental Institute of the University of Chicago, 1995), II no. 18, 40, 43-44, 63, 66, 158. Borg, Barbara. Mumienporträts: Chronologie und kultureller Kontext (Mainz: Ph. von Zabern, 1996), pp. 45, 88, 121, 129, 149, 152, 170-72, 210 no. 11. Fenton, James. "The Mummy's Secret." The New York Review of Books (July 17, 1997), pp. 57-62, p. 59; ill. p. 57 cited without inv. no. The J. Paul Getty Museum Handbook of the Collections. 4th ed. (Los Angeles: J. Paul Getty Museum, 1997), p. 59. Towne Markus, Elana. Masterpieces of the J. Paul Getty Museum: Antiquities. (Los Angeles: J. Paul Getty Museum, 1997), p. 116. Walker, Susan, Morris Bierbrier, et al. Fayum. Misteriosi Volti dall'Egitto, exh. cat. (Rome: Fondazione Memmo, October 22, 1997-February 28, 1998), p. 138, no. 102. Fenton, James. "The Mummy's Secret." In Leonardo's Nephew: Essays on Art and Artists (London: Viking, 1998), p. 27; fig. 8. Russo, Simona. I gioielli nei papiri di età greco-romana (Florence: Istituto papirologico G. Vitelli, 1999), p. 341; pl. I.
Walker, Susan, ed. 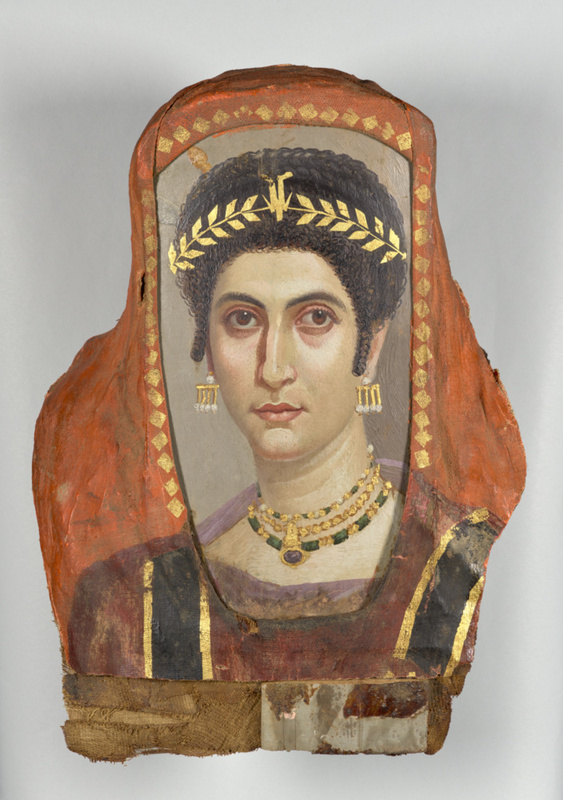 Ancient Faces: Mummy Portraits from Roman Egypt, exh. cat. (New York: Routledge, 2000), no. 60. Dupouy, Chris. Bijoux de musées à faire soi-même (Geneva: Minerva, 2000), p. 25. Mattera, Joanne. The Art of Encaustic Painting: Contemporary Expression in the Ancient Medium of Pigmented Wax (New York: Watson-Guptill Publications, 2001), p. 15; ill. p. 14. The J. Paul Getty Museum Handbook of the Collections. 6th ed. (Los Angeles: J. Paul Getty Museum, 2001), p. 59. Landman, Neil H., et al. Pearls: A Natural History (New York: H. N. Abrams, 2001), p. 66 (photo only). Munn, Geoffrey. Tiaras: Past and Present (London: Harry N. Abrams, 2002), p. 13, fig. 4. The J. Paul Getty Museum Handbook of the Antiquities Collection (Los Angeles: 2002), p. 221. Wisseman, Sarah U. The Virtual Mummy (Urbana-Champaign: University of Illinois, 2003), p. 24, fig. 10. Parlasca, Klaus and Hans G. Frenz.. Ritratti di Mummie. Repertorio d'arte dell'Egitto greco-romano (A. Adriani, ed). 2 ser. Vol. IV. (Roma : "L'Erma" di Bretschneider, 2003), pp. 47-8, no. 711, pl. 162,2. Spivey, Nigel and Squire, Michael. Panorama of the Classical World (Los Angeles: Getty Publications, 2004), pp. 22-23, fig. 26. Pointer, Sally. The Artifice of Beauty: A History and Practical Guide to Perfumes and Cosmetics (United Kingdom: Sutton Publishing, 2005), p. xvii. The J. Paul Getty Museum Handbook of the Collections. 7th ed. (Los Angeles: J. Paul Getty Museum, 2007), p. 52, ill.
Daehner, Jens, ed. The Herculaneum Women: History, Context, Identities (Los Angeles: J. Paul Getty Museum, 2007), fig. 3.3. Doherty, Tiarna, and Anne T. Woollett. Looking at Paintings: A Guide to Technical Terms. Rev. ed. (Los Angeles: J. Paul Getty Museum, 2009), p. 30, ill. The J. Paul Getty Museum Handbook of the Antiquities Collection. Rev. ed. (Los Angeles: J. Paul Getty Museum, 2010), p. 227. Corcoran, Lorelei H., and Marie Svoboda. Herakleides: A Portrait Mummy from Roman Egypt (Los Angeles: J. Paul Getty Museum, 2010), p. 15, fig. 3i; p.35, figs. 15-16; p. 78, fig. 45b. Causey, Faya. Amber and the Ancient World (Los Angeles: J. Paul Getty Museum, 2011), pp. 16, fig. 3.